As any artist will tell you, one man’s trash is another man’s treasure and a large production’s “trash”—whether an advertising shoot, film or large event—is a goldmine. As a project comes to an end and the creative departments begin striking sets and sorting through props, the dumpsters and heavy duty trash bags come out. If struggling filmmakers and artists of all mediums saw what entered the dumpsters destined for landfills and incinerators, they might tear up a little. And so the question becomes, why needlessly throw away material perfectly fit for reuse in other productions or art? Especially when commonly discarded items are layout board, foam core, rope, lighting gels, art supplies, constructed set walls, custom props, platforms, flooring, lumber and sheet goods. Since 2009, LA-based EcoSet has been working on a solution. According to Executive Director, Kris Barberg, EcoSet is a “responsible disposal vendor and sustainable production resource” providing film, television, web, commercials, and LA-based marketing events and productions with the means to reduce their environmental footprint. EcoSet achieves this objective through two main service sectors, which depending upon the needs and budget of the production, can be combined. EcoSet provides Zero Waste implementation on set and a back-end reuse service called ReDirect. Zero Waste is defined by the EPA as 90% or greater diversion from landfill or incineration. The City of Los Angeles has set a goal to increase its landfill diversion rate to 90% by 2025 and 95% by 2030. This will be achieved through mandatory recycling and food waste collection. Other major cities like San Francisco, Seattle, Austin, New York City, Washington DC and Minneapolis are further along with their Zero Waste goals. Businesses and corporations are including Zero Waste processes in their Corporate Responsibility commitments. Barberg notes that traditionally, EcoSet has operated as a strategic partner with advertising and marketing brands assisting in the onsite development, support and implementation of a Zero Waste standard for a project. A good example of this process is the collaboration they’ve shared with Target since 2009. As soon as a concept is ready to be produced as an ad, Target contacts EcoSet and adds them to the production calendar. A Sustainability One Sheet is included with the bidding specs sent out, and each department and vendor are required to collaborate with EcoSet’s services throughout the shoot or event. As soon as production begins, the EcoSet team is on site to meet and strategize with the production crew on sustainable practices that will endure throughout the entire project, focusing first on waste prevention efforts. The team also provides stainless steel water bottles to the crew as a means of minimizing plastic water bottles—often abandoned after one sip—from littering the set. Every day the EcoSet crew is on site first thing in the morning as breakfast is served, and are often the last ones to leave at the end of the day. Their priority is to manage as many materials as possible, including food waste from Catering and Craft Service, recyclable materials and all reusable discards. Currently, EcoSet averages a 93% diversion rate due to their dedicated crew operating from day to night and at all levels of the process. 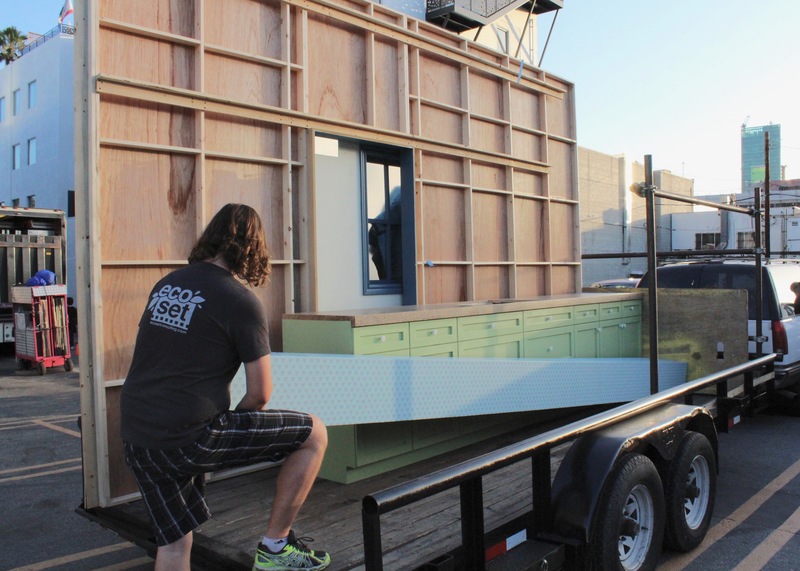 Much like their relationship with Target, when EcoSet is onsite for a production they are regarded as another department, referring to themselves as the “zero waste team” or “eco-crew.” While they know they cannot change the vision of set designers; they strive to make suggestions where they can. One example was a recent event involving a large number of trees to create a winter wonderland feel. EcoSet suggested renting fake trees over cutting down a large number of live trees that would later be needlessly discarded. Renting fake trees was an option the creative agency hadn’t originally conceived but they found efficiencies with the alternative, and disposal costs were avoided. As EcoSet expands their services to different types of productions and events, their ReDirect program makes one of the biggest impacts. Barberg explains that more than 50% of what EcoSet diverts from landfills involves recirculating custom creative elements, props and scenic pieces that are still in good condition, along with other production materials that are collected, stored and made available for free to the public. While advertising productions or marketing events can utilize both the Zero Waste program on set and the ReDirect program after the production closes, film and television productions can typically only budget for the ReDirect program. Because redistribution is such a big part of what EcoSet does, they have been expanding their service by encouraging more and more film and television productions to take advantage of the budgetary savings achieved through planning for the ReDirect program. Typically, productions must factor in disposal tactics such as 40-yard roll off bins or contract labor to deconstruct a set and drive to a landfill site. If they plan for responsible disposals in advance and request a custom estimate from ReDirect, however, they can potentially save time and money on their back end process. Taking advantage of the ReDirect service includes sending pictures and detailed descriptions to EcoSet or scheduling a walk through of the set. The more advanced notice a production gives EcoSet, the more they can save on EcoSet’s work to coordinate a pick up or receive a drop off to their Materials Oasis, store the items and then facilitate their reuse. Barberg shared that items, “Come in for a fee, and leave for free.” Productions can reallocate part of their waste budgets to EcoSet’s services. Educational programs and artists in the community then benefit from the free materials. This includes non-profits, schools, camps, indie filmmakers, artists of every medium, theaters and reuse enthusiasts. EcoSet proudly boasts a re-use network of over 1,000 recipients and an efficient notification tool called a “Free Alert” that informs individuals when new items arrive at the Materials Oasis. One recent Free Alert announced the arrival of a marquis light, a staircase, vinyl, linoleum, large pieces of carveable foam, platforms, cubes and more. While people are always clamoring for first dibs on the treasures of the Materials Oasis, there are a few pieces that are either quite difficult to find a home for—like a 30 foot tall proscenium arch used on a theater set—or made from materials that don’t hold up to long term usage—like MDF. Items that are difficult to store and non-recyclable are just a few of the challenges EcoSet faces that will affect the final quotes they give. The other is last minute notice for pick-ups. If a production is interested in working with EcoSet for a pick up, they should also remember that the company will not pick up debris or anything broken or dangerous. Non profits like Habitat for Humanity are the best option for functional doors, cabinets or architectural items, but EcoSet can take custom or theatrically designed pieces. knowledge gained will assist these budding filmmakers to implement their own “zero waste” productions whether they will be able to afford EcoSet services or not. Additionally, EcoSet staff have spoken on sustainability in filmmaking at schools like Santa Monica Community College and UCLA. No matter the size of your production or the scope of your project, keep these thoughts from Kris Barberg at the forefront of your mind. “With a plan in place, it’s not waste.” ReDirect is the segment of their work that is the most accessible to any scope of production. 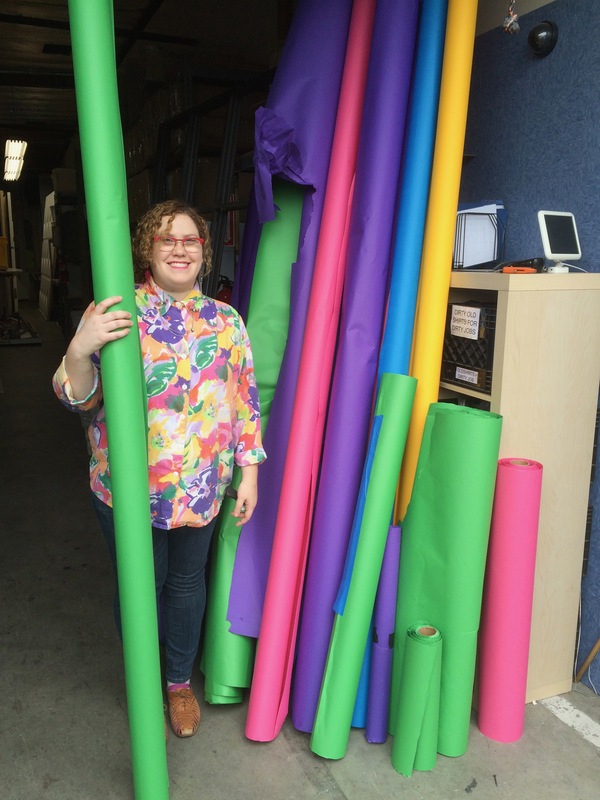 By factoring it in to the pre-production phase, any project can benefit from an affordable drop off location for their unwanted creative materials during wrap. Better yet, they could plan to source used materials as budget savings. “We see it work for students and indie filmmakers, and we believe larger scale projects can benefit from free reusable resources available at the Materials Oasis.” If you are looking for some extra tips on creating a “Zero Waste” environment on set, check out this Staff Me Up article on Best Practices for an Environmentally Friendly Production written by EcoSet. EcoSet can be reached at 323.669.0697 or fill out a contact form, here.